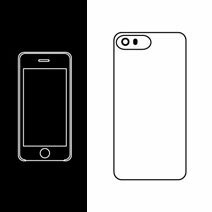 UltraSlim cases are characterized by their clean and minimalist design. The cover opens to the front and can be folded back completely. At the top, a small strap secures the perfect grip of the case. StilGut UltraSlim cases are ideal in terms off lightness and long-term quality. StilGut Couverture cases are made from genuine leather and available in trendy colors as well as different types of leather. 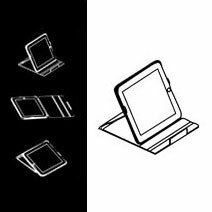 The front lid can be folded like a triangle and offer a flexible stand function that ensures easy use and comfort under all circumstances. 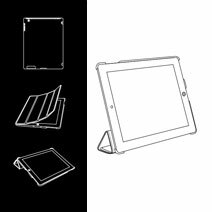 The Couverture case gives your tablet an elegant and high quality look. A must-have for all tablet users! The Book Type cases are characterized by their cover opening sideways. These cases are available in different versions. The "Talis" version has integrated card slots and is available with and without a strap: depending on the version, it is equipped with an isolated magnet or a button to secure the lid. 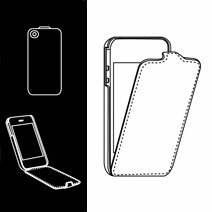 StilGut UltraSlim cases are thin, light and functional. The UltraSlim cases are made from high quality artificial leather with a microfiber coating on the inside. The stand function is one of the highlights of this case. It offers a variety of different angles, ideal to watch films or type e-mails. 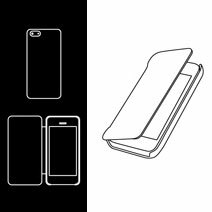 Minimalist, light and elegant, the cover type case offers optimal protection for the back of your smartphone. Within few seconds, your smartphone is inserted into the cover. The plastic shell offers a robust protection and is refined by genuine leather on the outside and microfiber fabric on the inside.